A generally sympathetic treatment, though also attentive to those many occasions when Emperor Freud wore no clothes. Kramer (Psychiatry and Human Behavior/Brown Univ. ; Against Depression, 2005, etc.) 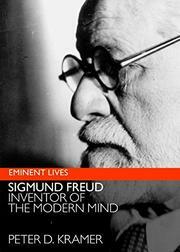 takes on the Godfather of psychoanalysis in this entry in the Eminent Lives series. The author’s prose—clear, precise, jargon-free—is well-suited to the task, but the volume, principally an intellectual biography, offers little scholarly apparatus (no endnotes, bibliography or index) and is missing a chronology of Freud’s life and a list of his important publications. Kramer spends much of the text discussing—very amiably—Freud’s failures as a scientist and a therapist. He properly praises Freud for his ferocious determination to illuminate the structure and workings of the human mind, but he also notes that Freud manufactured evidence, ignored conflicting data, misrepresented cases repeatedly and was frequently wrong. Kramer examines some of Freud’s most famous cases (e.g., the “Rat Man,” the “Wolf Man”) and discusses Freud’s procrustean determination to make his data fit his theory. He credits Freud for some useful vocabulary (transference, displacement) and for his narrative skills, but Freud comes across as ambitious, intolerant, petty, vindictive. And astonishingly hardworking: he wrote his books between 11 p.m. and 2 a.m. after a full day of consultation and study. Kramer is not much interested in the quotidian detail of Freud’s life. We do learn a little about his marriage, his children (daughter Anna comes off well), his books (Kramer sometimes fails to provide a publication date), his painful (and losing) battle with cancer of the mouth and the rise and fall of his friendship with one-time disciple Carl Jung. The book, while missing features useful to general readers, remains a clear and sometimes eloquent introduction to the life and thought of the world’s first shrink.